Edraw is an easy to use 2d landscaping design software that allows homeowners to plan their landscapes simply. Homeowners can use it to create home plans, design living and dining rooms, kitchen, kid's rooms or master bedroom. It breathes new life into your design and guide you to create decks, patios, fencing, edging, lawns, custom decks, and more. However, whether you are new home owners, landscape architects, or just gardening enthusiasts, this program stands out as a handy tool for you. What is more, our software is more affordable and has more functions than other programs. Now, you can actually say goodbye to graph paper and colored pencils. 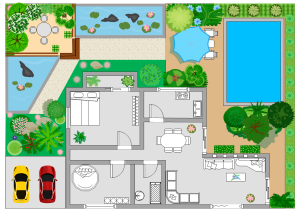 Discover the power of Edraw as the superior choice to design your landscaping: Try it FREE. The bright, user-friendly interface is a snap to understand. The in-depth tutorials quickly bring you up to speed. Operating the program is equally effortless. You simply drag and drop diverse floor plan symbols like shrubs, trees, flowers, buildings, paving, and ponds into a large grid and lay them out as you prefer. You can change the foliage color and zoom in or out on your garden. Landscape drawing does not need to start from scratch. Just drag the ready-made symbols from the libraries and drop them on your page. Landscaping design couldn't be easier! You don't need to be an artist to look like one! These features enable you to capture and present information in pictures, while being a pleasure to use. Zooming, scrolling, multi-selection and multi-level undo/redo supported. No artistic skills are required. Automatically aligns and arranges everything so your drawings look great. Distinct colors, fonts, shapes, styles, pictures, text and symbols for each object of the diagram are available. 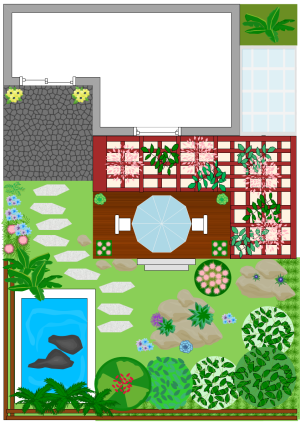 Easy-to-use landscaping design tools with rich examples and templates. In-depth tutorials to help you learn to draw network diagrams. Step 2 Visualize your design. Drag and drop shapes, move, resize or recolor them. 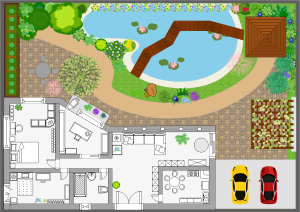 A landscape designs example, well-designed and visually appealing, is available for you to download and use at anytime. 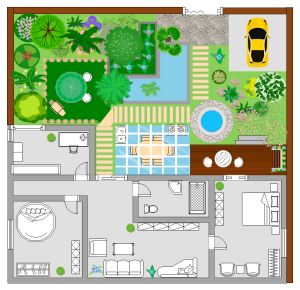 A garden plan template is presented on the right, which is ready to use in vector format for your own designs. Free technology support. Expert mentoring to reduce time of adaptation and maximize return on landscaping investment.